Then last night, a story came. 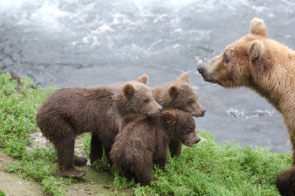 A powerful story of Mama Bear. How Mama Bear rescued her rather wayward cub who had got himself into a deep dark cave and couldn’t quite get out of it. Meanwhile I’ve been watching my son and myself be in a deep dark cave these past few weeks. Essentially not really connecting. I feel his pull for me, and instead of moving towards it I withdraw. It’s difficult. The more I withdraw the more he demands my attention. He’s nearly eight. It’s been a challenging time for me coming back to live on the mainland after our year on Erraid. I have of course completely romanticized the experience. Now in my memory it was all sunny weather (imagine when in reality you just have to say west coast of Scotland and no amount of fiction can get rid of the fact that it rains a lot!). However I do seem to go all glassy eyed and dreamy when I think about our year. Meanwhile the children have landed back into live in our community on the mainland like they were never away. Amazing. Friends, School, connections with people and places all came back to them effortlessly. For me it’s been a little more unsettled. I’ve struggled with leaving the Island. I think my son notices it. I have wondered if it makes him unsettled. He therefore has been dancing a difficult dance around me. It’s been challenging and perfectly tiresome. I have done The Work of Byron Katie, I’ve prayed, I’ve moaned to a few friends and I’ve found some peace.. and then lost it again. And then yesterday I went to my morning sanctuary, I prayed for some help with this dance we’ve been doing and in the evening Mama Bear came to help, plus and eagle, a dark cave, a landslide, a chasm a 1000 miles deep. Like all good dramatists (or maybe cruel mums), I said “well, let’s wait and see what happens”… He trembled, really terrified, he saw at that moment how far the cubs had gone out of line, how much danger they were in… literally they were beyond boundaries. Meanwhile Mama bear had given up all hope of finding them but luckily had followed an eagle, sign of spirit, Mama bear let go of trying to do it herself and sought help..